Day 2 of NeoCreation Week has begun. Today, they are asking you to come up with a new Neopian Land! Again, you will have until midnight NST tonight to enter for a chance to win Comic Con codes. Today's hashtags are #NeoCreationWeek and #MyNeoLand. 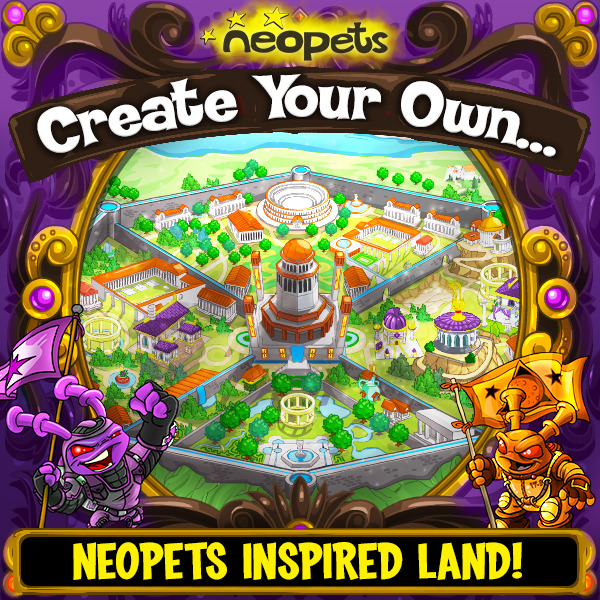 Day 2 of NeoCreation Week is all about creating your own Land for Neopia! Show us how it’ll look, give it a name and what are 3 things that Neopians can do in this land? Are there games? Shops? A hole in the ground filled with pickles that users can accidently fall into? Make sure to use the hashtags #NeoCreationWeek & #MyNeoLand, and submit before tonight 11:59 PM PST! Contest update! So many fantastic submissions were received from day one of NeoCreation week, so now ALL winners will be announced Friday 10:00 AM PST. Keep the #NeoCreations coming! There may even be a special reward for those who participate in every contest throughout week! However, the deadline for each day remains midnight. As a reminder, you can enter on the Neopets Facebook page, on the Neopets Twitter page, and on the Neopets Instagram page.